You need an Optimum Pressure Cooker PRO in your life. Scroll down to enter the competition to WIN! Hopefully you saw my review of the Optimum Pressure Cooker PRO earlier this week. It’s a new high tech gadget from the people at Froothie UK and it’s fast become my favourite kitchen appliance. In short its a multi cooker that not only uses pressure cooking technology to speed up cooking times whilst keeping food moist, it also deep fries, roasts, braises, defrosts, simmers and much much more. Would you believe it even has specific settings for CAKE and PIZZA! I’ve got your attention now haven’t I? If you want to read the full review you can do so here. I am running this competition on behalf of Froothie UK using the Rafflecopter widget. Not sure how to use Rafflecopter then check out the short video here. There is one main way to enter and several ways to get bonus entries, including bonus daily entries such as tweeting about the competition. For information on how to find the URL of your tweet click here. If you already like/follow please comment in the Rafflecopter widget and let me know to make sure you get your entries. There is one prize of an Optimum Pressure Cooker PRO to be supplied by Froothie UK who be will responsible for sending it directly to the winner. I am running this competition in good faith on behalf of Froothie UK. Their decision is final and no correspondence will be entered into. They reserve the right to substitute the prize for one of a similar type / value if the prize above is not available. As I’m an Ambassador for Froothie I get paid a small commission if you buy an Optimum Pressure Cooker PRO using one of the links in my post. Of course there’s no extra cost to you but it will make a big difference to me! I would like to win to cook healthier meals for my family and not spend ages preparing them. I would cook something with beans first as I usually avoid them as they take too long. It would enable me to cook lots more meala from scratch. I’d cook a curry. My late mother in law stole my old one bless her I never got reunited with it x I would cook veggie stews casseroles etc . I dont have a pressure cooker so would love to win one! I would make home made pease soup first – cooking the gammon first to make the stock! This machine looks amazing and to be honest I would be so excited to try ALL the new settings! Roasties in a jiffy, I’m in! I’d love this pressure cooker because I’d like to make super quick meaty casseroles when I came home from work. It would be much better for the health of my family, instead of relying on ready meals. This would be such an improvement to our kitchen.I’d try Lancashire hotpot first. I’m quite worried about the hikes in gas and electric prices and pressure cookers are cheap to run, plus my friend made an amazing risotto in hers! Because it looks amazing and I would make homemade chicken curry. I would like to win because it will make my life so much easier. The first cook would definitely be a beef stew. I’ve seen an amazing recipe for Colombian Chicken Stew which I’d love to try first! It would be useful when I’ve had a busy day at work. i would make a lovely stew first. I work and have a large family so a pressure cooker would be so convenient for me. I’d cook a chicken casserole as it’s their favourite. I am at a point that I need to eat soft foods and the pressure cooker is an ideal item for creating great tasting food with the benefit of making meat so tender that I can digest my meals with little concern. I would start by making a beef stew. I’d love to make a lamb shank! Think it would be delicious! I would love to win this to give to my mum, I think she would make a beef stew first. Thanks for the giveaway. I had a pressure cooker years ago when the children were young. I threw it out when we moved House and have regretted it several times. This new type sounds amazing. I would love to win it and I think the first thing I would cook in it is a tasty beef stew with dough boys (dumplings). It would save me a lot of time and help me be more heathly. because of mine and my other halfs silly shift patterns, we may not eat till 9pm when i finish work at 8pm, so this would be fab to get set up in the morning and he can just switch it on so it is cooked in time for when i get home. I have never used a pressure cooker before but it looks like it would make life in the kitchen easier and quicker. My mother in law swears by her pressure cooker. a great space and time saver for our busy home! I would love to try a cake in it, i’m hopeless at the timing!! I would like to win so I can make a serious curry for the very first time. I would love to win because there are two particular dishes I would like to cook on a regular basis that need to be cooked in a pressure cooker – Brazilian Beans and Curried Goat. I actually don’t cook AT ALL-Maybe this will finally be the incentive I need! I would really like to win this pressure cooker, My friends and my Dad own one and say it is brilliant! Some interesting comments I have read, thank you. Have not had the pleasure of using this item of cooking …..YET… dare I say? Please accept my entry. I love all the nifty functions, it would save me so much time in the kitchen. I think I’d have to try baking a cake first! Great post! Would love to win. I would love to win this as it could be used for so many things, would love to cook up some beef for a nice pie! This would be so useful in my kitchen. I’m always scared of pressure cookers (that they explode) but this one doesn’t look like the normal pressure cookers. fingers crossed! Bet it would make a pearl barley and root veg soup quickly, though I think my vegan daughter would make good use of it. I would love this prize I think a pressure cooker is an essential in the kitchen. I would use this to make a batch of London Particular soup. With both myself and my partner working full time and a horse, 3 dogs, 2 cats and a rabbit to look after, we need something to make tasty and easy meals quickly! Both my better half and I have been trying to be more creative in the kitchen and this pressure cooker would give us lots of options as it is so versatile. He has a labourer working for him at the moment who is a chef by trade so some friendly competition between him, his business partner and the chef has developed – this might give him an edge 🙂 Plus I’d get to sample some of his creations as he puts ingredients together that I never would but somehow comes up with something tasty. I have chronic health conditions and I can see this might make life a little easier – fingers crossed. I’d love to make a hearty casserole with dumplings. This looks like it would be a fab addition to the kitchen to cook healthy meals for the whole family. I think it’d be one of those items that would be used almost every day of the week! I once had an old fashioned pressure cooker to use on the hob and I was terrified of it! This looks so much safer and more controllable. My other half loves the pressure cooker! But we bought a new one recently & it’s not very good this looks much better! I’ve been looking at these and wondering is it just another gadget. I’ve had deep fat fryers and I have a slow pot too but after reading your review I think you have twisted my arm to get one if I don’t win this one. They can do so much, saving time and effort and seeing as I am a bit of a lazy cook, I think that one of these would suit me. I might actually enjoy cooking again! I’ll make a lamb casserole! I would love one and I would make a lovely irish stew! I Love to cook currys and they always cook best in the pressure cooker so would be amazing to win, the first thing i would make is a lamb curry. I’d love to win a pressure cooker to experiment with new recipes. I’d do pork first. I’d love to win a pressure cooker because I cook almost everything from scratch because of family allergies and this would speed up the cooking. I have always wanted one, but was too scared to buy an old fashioned traditional one. I would love to be able to cook loads of food from scratch in reasonable time with all sorts of cuts of meat. They sound amazing! I make a lot of Jams and Chutneys and having a pressure cooker would save so much time. I’d love to win this as my ancient hand me down one has finally died. The first this I’d do is chickpea curry. Love that a pressure cooker means no more soaking. My mum used to cook a lot of family dinners in her pressure cooker, the first thing i would do is get her recipe for the mince, beans and pasta dinner which was one of my favourites. I would love to win this because I struggle with certain things and would find cooking so much easier with a pressure cooker! I also LOVE pressure cooked veg 🙂 Not sure what I’d make first; the world is my oyster! I’ve not had a pressure cooker for some time but would love to have one again. They make life so much easier with how quickly and well they cook food. It would be great to make a really nice veg stew. Would love to win, could cook a lovely Thai Chicken curry with it. 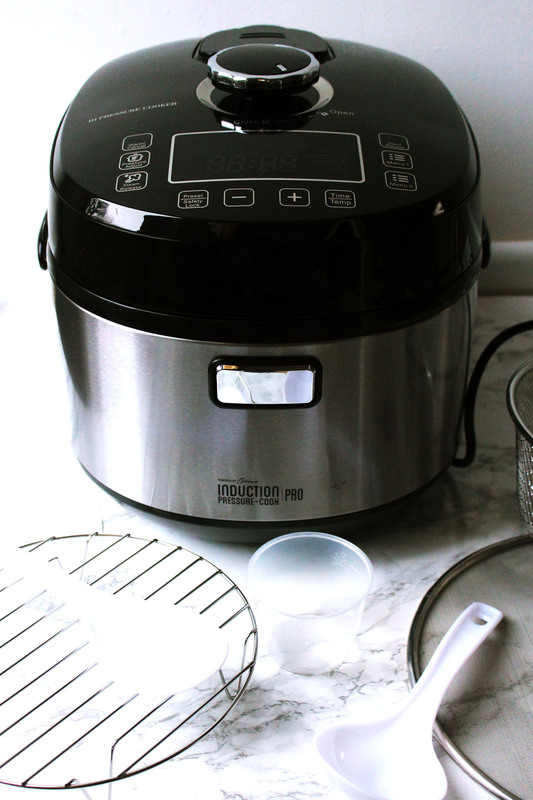 I’d Iove to win as I’ve always wanted a pressure cooker and now I know I can make cake in one I want one even more – I would definitely make said cake first! I’d like to make a traditional Welsh Cawl. I would like to try and make a chicken curry. I’ve not done one before. I would love to win this fabulous pressure cooker because it would make life a lot easier – it would be ideal for me and my kids because I could put a nice stew on before we leave in the mornings and it would be ready by the time we all got home. It would be really nice to be able to come home and put my feet up for an hour knowing dinner is ready and just needs serving instead of spending an hour or 2 prepping & cooking a meal. Bliss! I would love to try this, I’m no good at faffy meals – it’s better to just chuck everything in the pan! I would like to speed up my cooking and a pressure cooker would help no end and I would love to make some beef and winter vegetable stews in it. I’d like to cut my cooking time down and I’ve also heard the food really tastes nice in these. I’d make a nice roast beef and vegetables. Perfect for our busy life. I’d definitely cook some pulled pork and some slow cooked veggies – mmmm drooling!